You may add a fake student account to Etudes, and then add it in all of your sites so that you can log on and see exactly what your students see. The steps for adding a guest or a fake student to your site are the same. We strongly advise against adding *real* students in this way. Please rely on your school’s registration process to add your students to your site. To add a fake student, follow the below steps. Enter a valid email address for your fake student. The password will be emailed to this email address, so it is critical that you enter a valid email that you can check. Also, enter a different email than what’s associated with our instructor account to avoid conflicts. 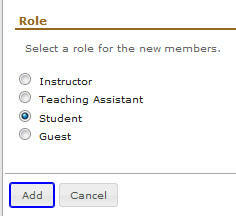 Select the ‘student’ role and click on Add. Check your email to get your fake student’s password. 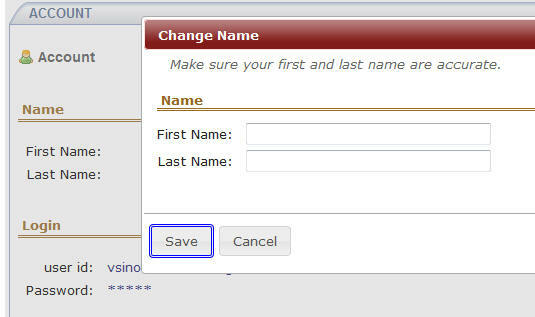 To log in as your fake student, enter the entire email address as the User ID. After you log on with the guest account for the FIRST time, you will need to establish a strong password. Then, click on Account up on top. Click on edit icon to the RIGHT of the label “Name”. Give your fake student account a First and Last Name. We recommend “Test Student” or something similar. Note: By adding Test Student, it lets students know that this is not a real classmate who is logged on. This is the honest thing to do, and it will be clearly understood by your learners. Do not make the first and last name of your fake student the same as your official instructor account! If you add your real name, then students will see two entries with your name on the Roster and will be confused about who to send Private Messages to, and may end up sending you messages to your fake account instead of your instructor account.